I was very honoured to be asked to produce the film that was shown as the visual component of this concert in the Walter Phillips Gallery, located in the Banff Centre for the Arts. The Codepink projects are very worthy and I was proud to be able to support them and be associated with an initiative that is intended to bring people together to work for peace. In addition to the photos of children and playground construction in Gaza, we used photos of American children playing in a playground provided by Ione. She explained at the concert that she thought it was nice for them to play together. Ione was inspirational in the production of this film as she helped me to gain a more precise understanding of the concept of the musical work. Many people complimented me on my work after the show and it will remain one of the highlights of my time in Banff. I did document the performance on video and the audio was recorded by the Banff Centre technicians, led by John DS Adams. 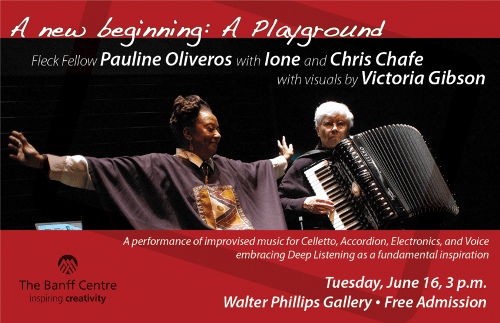 At some point, I hope that my film, “A New Beginning: A Playground” will be shown during future concerts when Pauline and Ione perform this piece. When the audio is mixed, there are plans to produce a DVD with the soundtrack of the concert. When it is complete, it will be available from the Deep Listening Institute site. Tech Notes: All photographs and digital artworks were prepared in open source software, The Gimp. The film was created using Final Cut Studio on a Macintosh workstation owned by the Banff Centre. This past week, I have been involved in documenting the programming and rehearsals and finally, the recording of the audio for the musical quartet, EHRES. This is only one of the projects I have been involved in while I have been in Banff, and it has been very exciting to watch the MAX/MSP programmer, Ryan, work on creating a gesture control patch. John DS Adams not only plays in the group, he was the recording engineer on a hugely complex session that included 36 tracks of recorded audio. I have lots of work to do editing the video and photos and then editing them to the music that was recorded yesterday and today. I should have some photos ready to post soon, but I want the group to see them first. The next steps include processing the photos, editing the video, matching the visuals to the mixed audio and authoring a DVD. I will be busy for a while doing this. I have quoted some information about the ensemble sent to me by Norm Adams, composer, cellist and electronics player. EHRES is Pauline Oliveros, John DS Adams, Ione, and Norman Adams: a quartet of performers employing a groundbreaking system of acoustic and electronic interconnections for live performance. EHRES creates multilayered networks of connections allowing all sounds to be shared, processed and distributed to a multi-channel sound system. 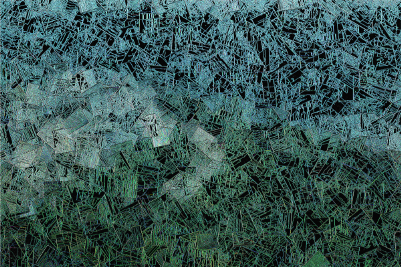 The web of connections begins with the interaction of the artist’s immediate music making process. EHRES balances on the unique qualities of listening, intuition, emotion, timbre, and range that make their individual methods of music making present. Their web extends further into electronic sound, as the musicians process various signals, as the artists interact with one another’s acoustic and electronic sounds and as the sounds move through the performance space, via the immersive, eight channel speaker array. Musical structures are created spontaneously within each of the performer’s instruments/systems and extends into the interconnections and interactions between the artists and the control of their systems. EHRES has performed on the suddenlyLISTEN Series in Halifax, Nova Scotia; on the NUMUS Series in Waterloo, Ontario; and at The Lincoln Center Outdoor Festival in New York City. Tech Notes: I have tagged this post as Open Source because all of the photos will be processed in Ubuntu Linux using various software. Ubuntu software handles RAW conversion with a Gimp plug-in or in RAW Studio.